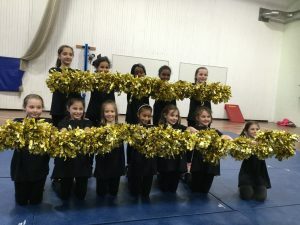 Cheer Leading Team win Gold! 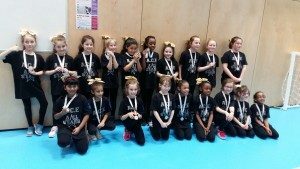 On Wednesday 27th February our Cheer Leading Team took part in a Cheer leading competition against six other schools and ….. they won a Gold! They thoroughly deserved this win and worked so hard to produce a complex routine that was fascinating to watch. Thank you to Ciara, the Cheerleading coach and to all the parental support on the night. We look forward to performing it to the whole school! 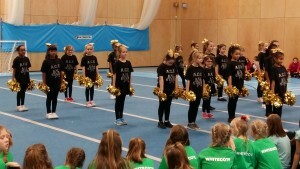 On Wednesday, 12 girls from Year 5 and 6 took part in the White Rose Cheerleading competition at Morley Academy. They performed a dance routine with poms in front of a large audience and were thrilled to be awarded 3rd in their category. They also took part in a ‘Stunt’ workshop and Simrath demonstrated skill and bravery when lifted by the girls! The Cheerleaders wowed the judges to seal the Silver Medal. 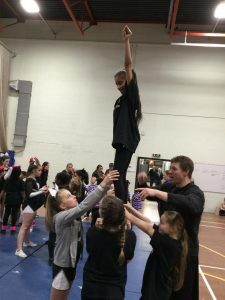 Allerton C of E Primary School cheerleading team got their just reward at the Active Schools Cheerleading Tournament held at The Ruth Gorse Academy. The team have been incredibly committed to the training and have been working hard to master their routine and that they did. I was proud of each and everyone of the team and they were a credit to the school and themselves. Well done Team A.C.E! !